Today I went out in search of adventure, in the form of an unmapped wander through two neighborhoods of Cairo. The city is a study in contrasts, and the juxtaposition of different areas sometimes feels like the juxtaposition of two totally different worlds. 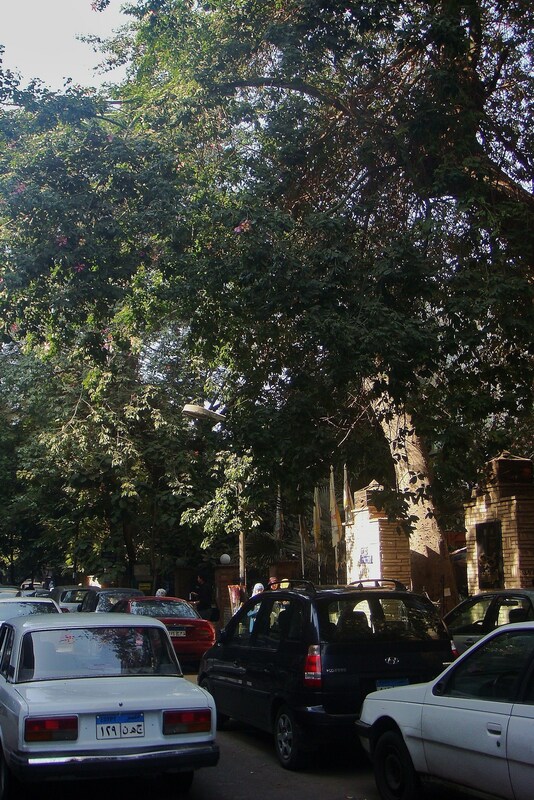 Though there are many indicators that show the difference between places, I’ve come to the conclusion that wealth in Cairo is measured in trees and pavement. These two factors alone will tell you everything you need to know. The morning started in Zamalek, one of the richest neighborhoods of Cairo. Located on an island in the middle of the Nile, it hosts number of foreign embassies, meaning a lot of foreign diplomats and their retinues live here as well. The boulevards are wide, tree-lined, and evenly paved. The buildings are all modern and mostly soulless. Very little trash is in the street. Boutique shops are full of expensive housewares, and multiple bookstores sell English-language books (hamdulilah!). I was able to take a yoga class today in this expat enclave, my first since arriving in Cairo, and it was wonderful to find something here that was so integral to my life back home. This is what wealth looks like: broad, tree-lined streets paved with asphalt. 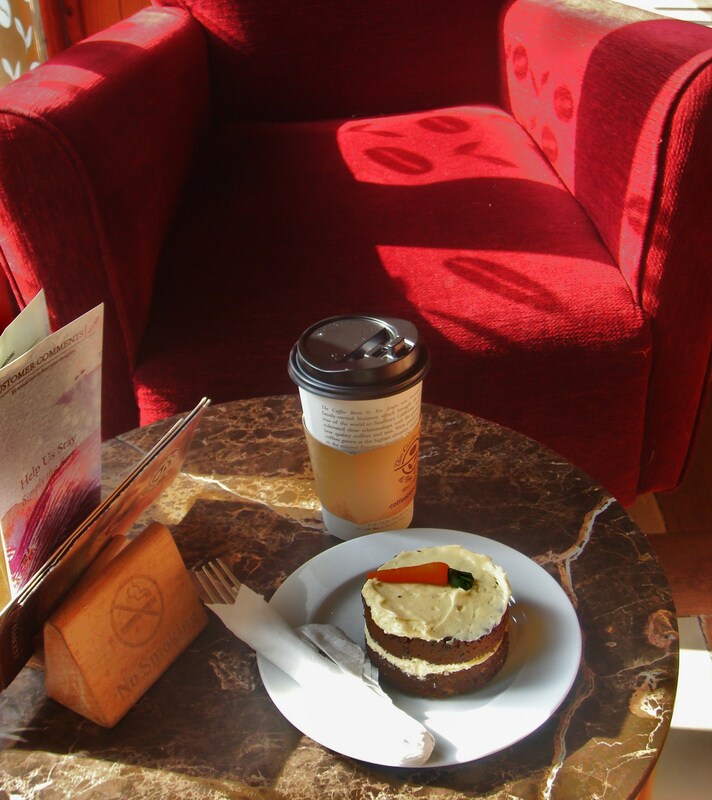 After yoga, I wandered until I felt peckish and found an upscale coffee shop, where my tea and carrot cake cost more than I usually spend on proper meals. Despite the exorbitant prices, the coffeeshop was packed with expats (and wealthy locals), presumably there for the atmosphere of a place that felt like the coffeeshops at home. Wealth also looks like overpriced tea and carrot cake, plush chairs, and a spotlessly clean shop. Walking around Zamalek, I heard almost no catcalls. No heckling of any kind. After two months of near-constant commentary on every moment that I spent outside, it was almost surreal—like I had been transported into a different universe from the one that I normally inhabited. The island felt like just that—an island. A tiny, wealthy bubble of Euro-American sensibilities in the midst of the teeming chaos that is Cairo. It was nice, for a while, to have a small break from my normal reality. But after a few hours, it made me feel bored. One of the things that I love about Cairo is the breath of the unexpected that pervades my experience here. I felt cut off, in Zamalek, from the real spirit of the city, so I decided to go back to the city’s roots. Back to Islamic Cairo, with its lively markets and minarets, with its history and soul. The streets are narrow, unpaved, and treeless. Space is a commodity here, and so is asphalt. Trees are too much of a luxury to grow. This is what streets look like in Old Islamic Cairo. Narrower, unpaved, no trees. Though the streets aren’t as nice here, the buildings are infinitely more interesting. 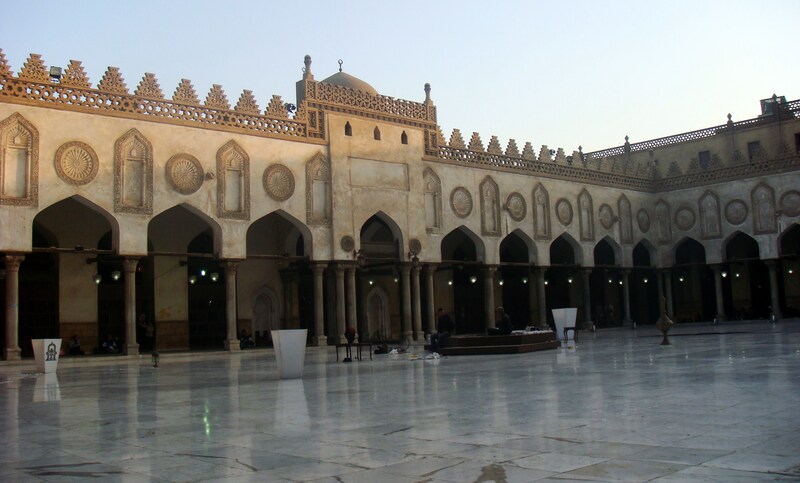 I started out at Al-Azhar mosque, which was built in the tenth century and is one of the oldest mosques in Cairo. 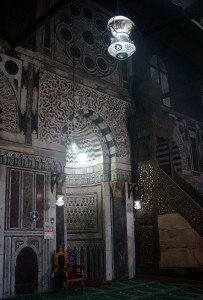 It’s a glorious confection of white marble, a wonderful break from the heat and the dust of outside. From there, I wandered in a fairly directionless manner, my main priority being to move in the opposite direction of the tourist market and its accompanying touts. I succeeded, moving through neighborhood markets selling produce, local clothing, and basic housewares, passing coffee shops where men sat with shisha pipes for hours at a time. These places were not designed to trap tourists, and so I walked unmolested and mostly un-commented upon until I reached the Mosque of Al-Mu’ayyad, a glorious structure with beautiful interior polychrome designs. 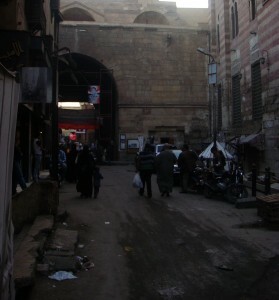 From there, I went to the neighboring Bab Zuwayla, the southern gate of Medieval Cairo. 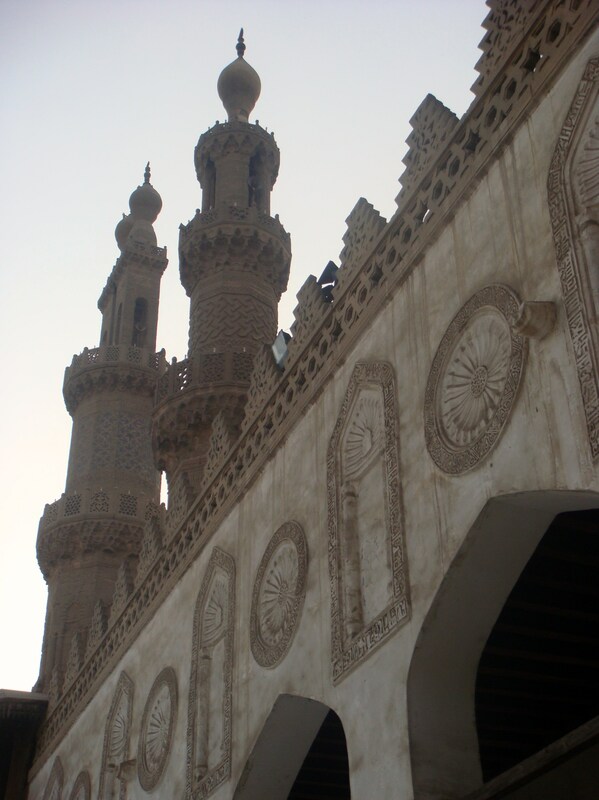 Above the gate stand two minarets , and I braved the narrow, unlit spiral stairs to watch the sunset. 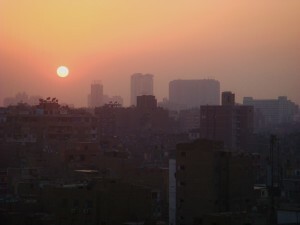 Looking out over the city, glowing under the light of the setting sun, I felt a surge of affection for my adopted city. There’s so much history here, so much life, so many different influences that come together to make the city vibrant. For all their differences, Zamalek and Old Islamic Cairo both have their place, as do all the other disparate neighborhoods here. Despite its many challenges, I’m glad that I can call this city home. 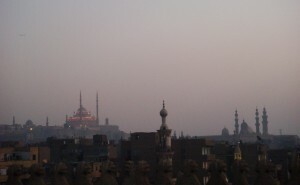 The minarets of Cairo's skyline at twilight.